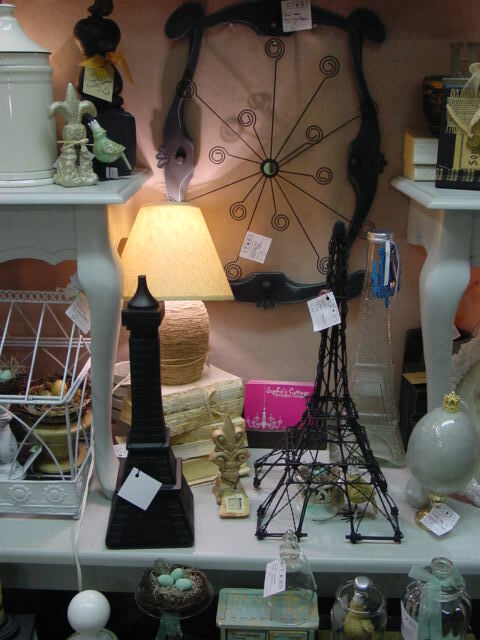 I’ve almost always kept a little ‘sub section’ of Paris chic items in my booth at Stars. 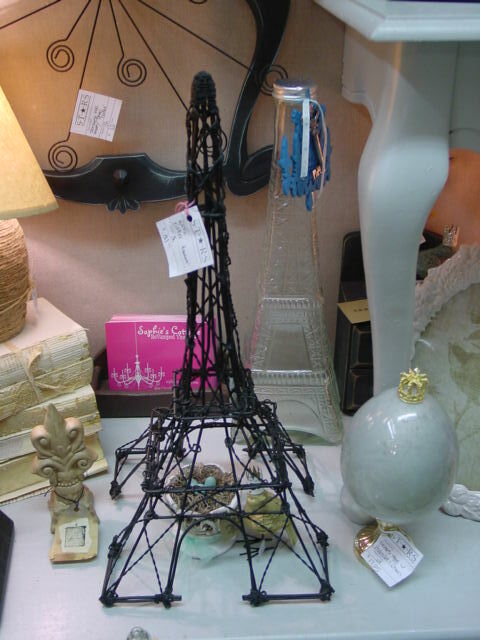 Eiffel Tower ‘sculptures’ are fairly common to find at estate/rummage sales and thrift stores. 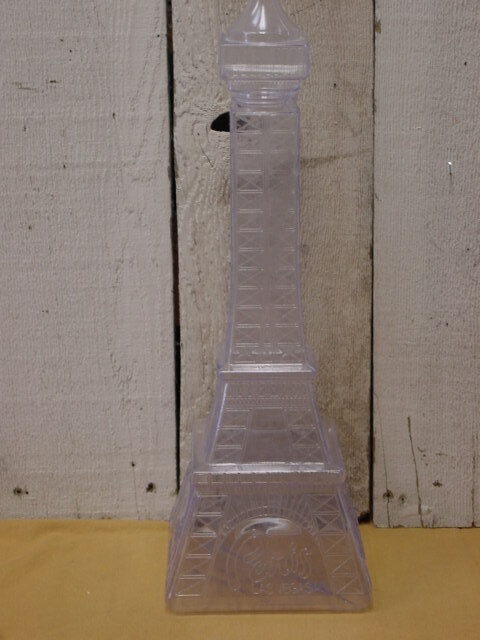 This big plastic bottle from Paris Las Vegas is a frequently found item. I think someone told me that it is a ‘drink container’? (heckuva drink!!) I have bought and re-sold several ‘as is’. 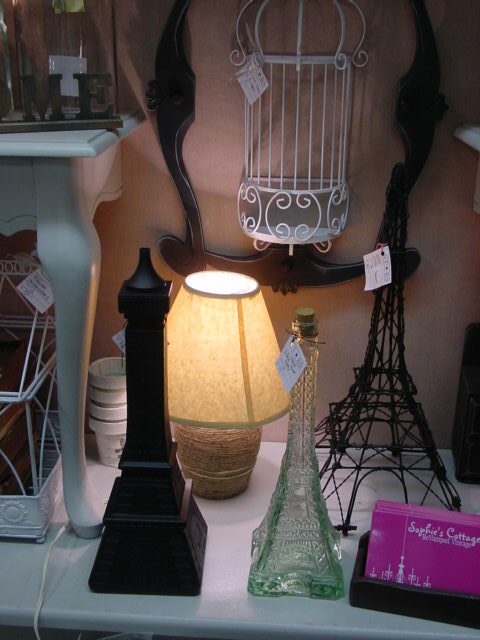 But this last time, I had a heavy glass Eiffel tower bottle and a substantial black wire Eiffel Tower sculpture; and the clear plastic just looked too ‘flimsy’ in the group. Flat black spray paint to the rescue! ( the cheapo $.99 can @ Home Depot kind!) Looks SO much better painted! I thought about taking it a step further, and lightly sanding all the raised parts to enhance the detail more. Tested a small spot and it just looked ‘scratched up’. SO I painted over it again. Here it is, on display in my space at Stars. Can you see it there, behind and to the right of the black wire one? Found it at a recent rummage sale. It WAS one of those kitchen decor bottles filled with all sorts of chili pepper and olives and green things, artfully arranged in vinegar. 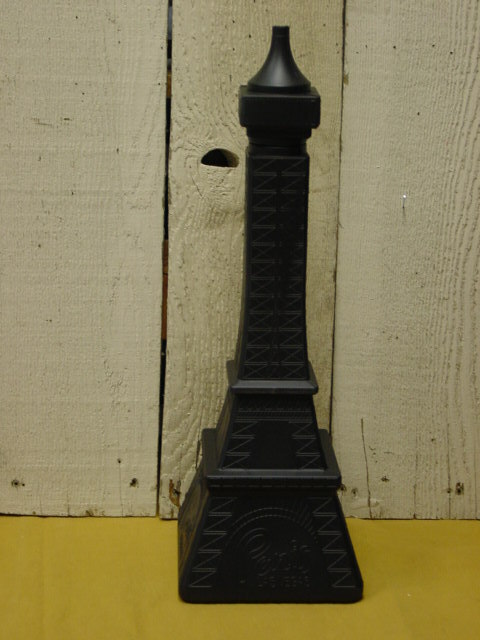 More Paris themed items in the works. A wood bread box, a vintage wood canister set and some tags! 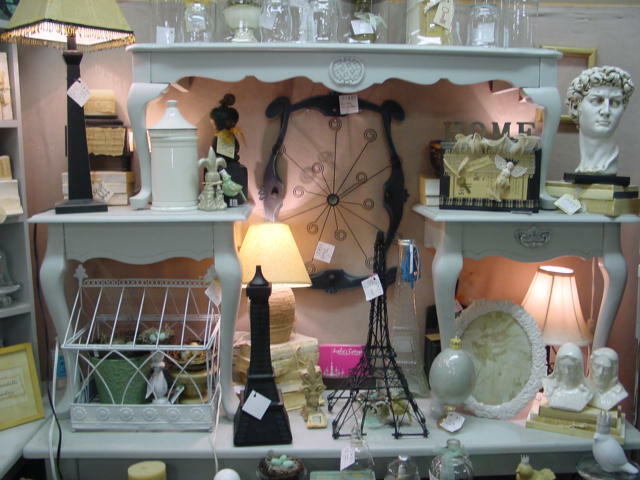 You’ll find these items (and LOTS more!) 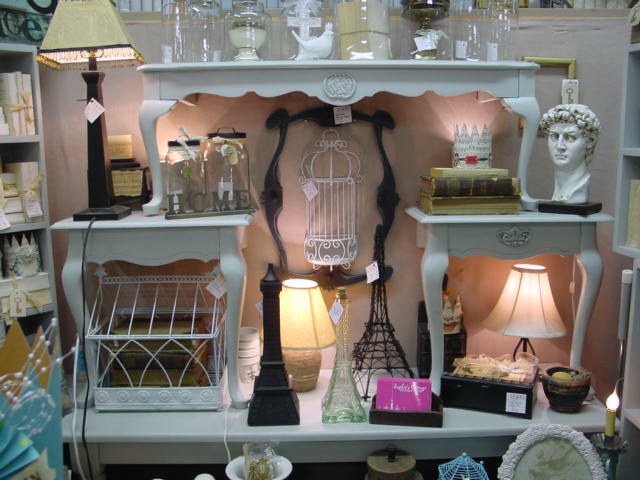 for sale in my booth at Stars Antique Mall in Portland, Oregon. Open 11am – 6pm seven days a week! I recycle a lot of bottles and have found if you get a really nasty one, use Oxyclean. I fill my sink with the hottest tap water I can, add little dishwashing liquid and 2 scoops of Oxyclean. Make sure the oxy dissolves. Put your bottle in gently and let it stay there till the water is cold. Rinse and enjoy. Works pretty much all the time. Love your stuff!